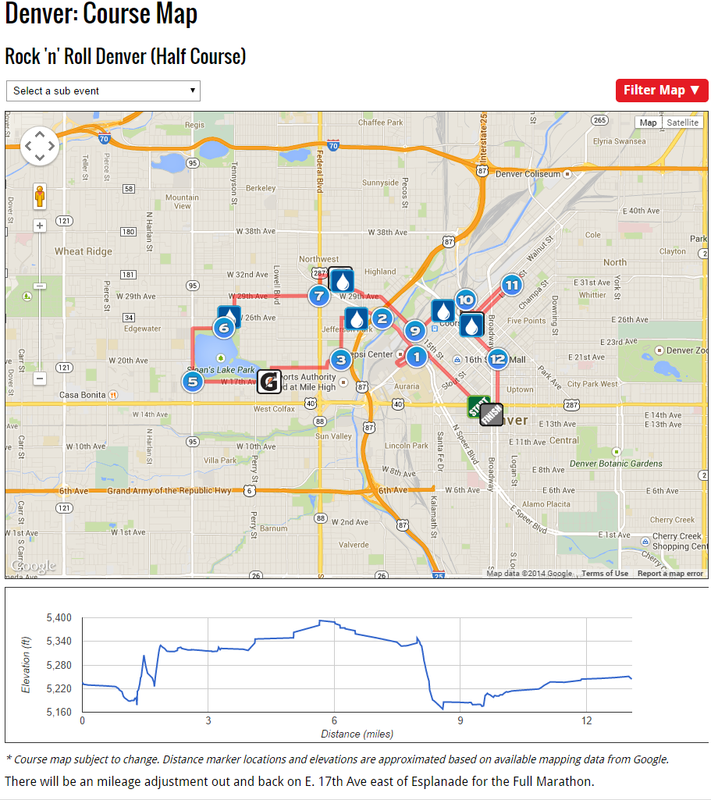 Denver Rock ‘N’ Roll Race Recap! Um, hello Monday, where did you come from? Ever have one of those weeks (or series of weeks) that in every way flies by? I have just experienced this the past three weeks. I am actually not entirely certain where October has gone and how Halloween is THIS WEEK. But here we are, regardless. Oh, and my office is dressing up as the crew from The Life Acquatic with Steve Zissou. How amazing is that? And if you haven’t seen the movie, you definitely should – Wes Anderson is a genius. A little over a week ago my life was occupied by first a promotion (hooray! Have I mentioned how much I love my job? 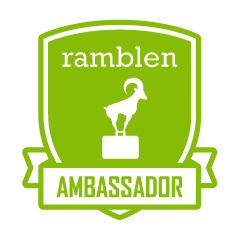 ), and an incredible training opportunity for our office. Our entire staff was able to attend certification training for the Myers-Briggs Type Indicator personality assessment. It was life changing! If you haven’t taken the assessment and received a personal interpretation of the report, please invest in yourself and do it! It is so enlightening about individual self, communication and interaction with others, and provides a deep understanding about the people with whom we surround ourselves. I learned so much and just want to share it with everyone! Two weekends ago was a big one for the hubs and me. 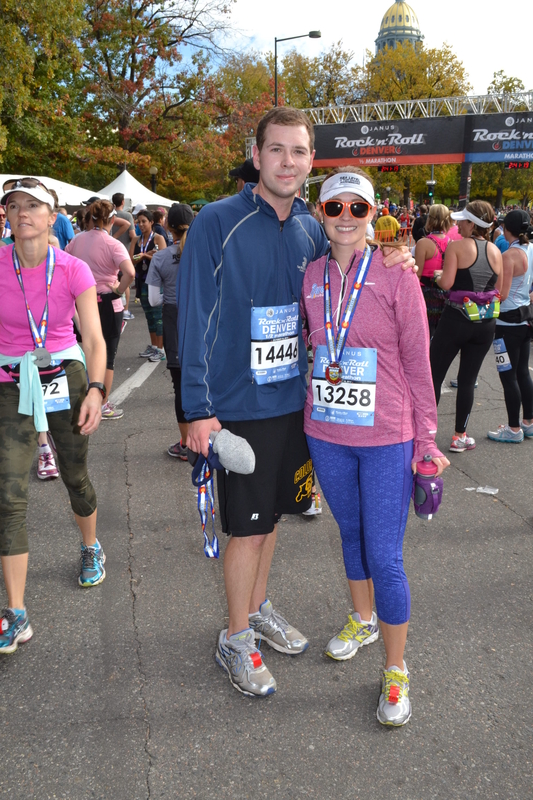 We participated in my hubby’s first half marathon, and my first half at altitude! 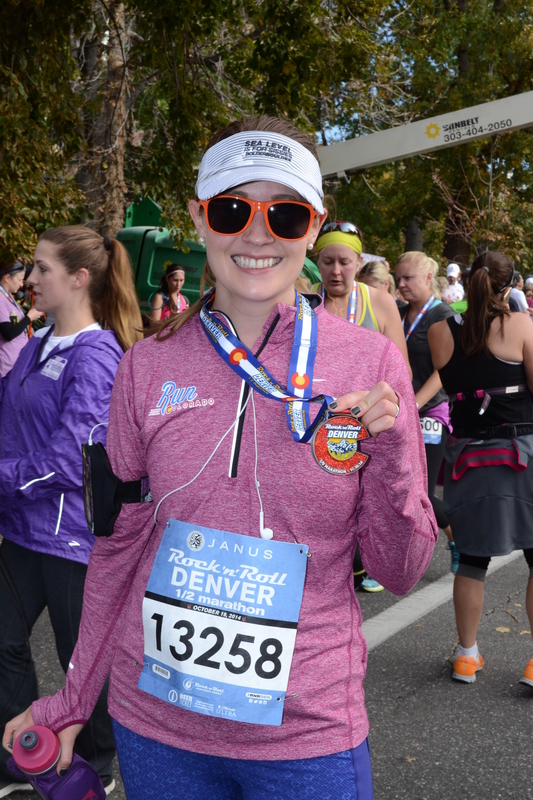 Ms. BakeNBurn gave me the idea to register for the Denver Rock ‘N’ Roll Half Marathon after reading her post on the RNR USA. After traveling for two weeks abroad, coming down with a serious and lengthy cold, and making major transitions at work, I didn’t entirely feel prepared for this race, and was just praying for a 2:30 finish. 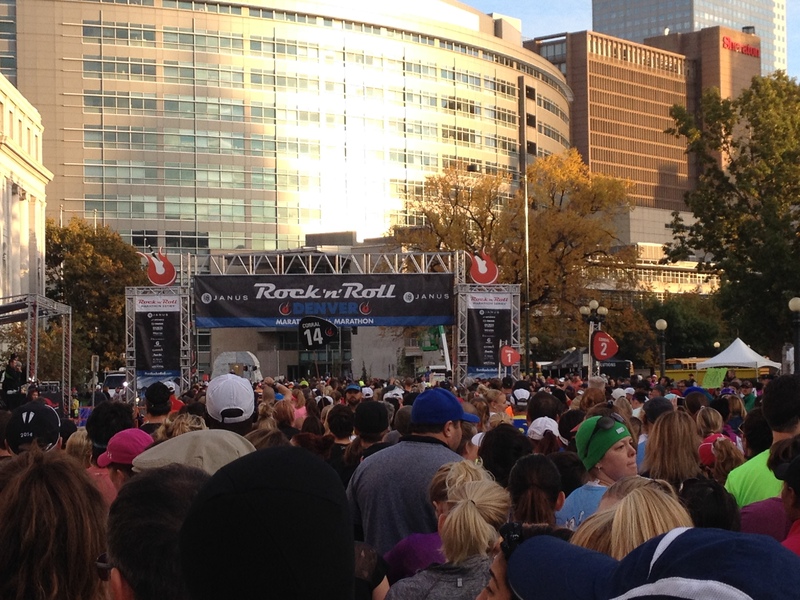 Thankfully two weeks prior I ran the Denver Hot Chocolate 15K, and appreciated those 9.3 miles as practice. The next weekend the hubs and I went for an 11 mile run in some horrendous weather conditions, and felt pretty good afterwards. 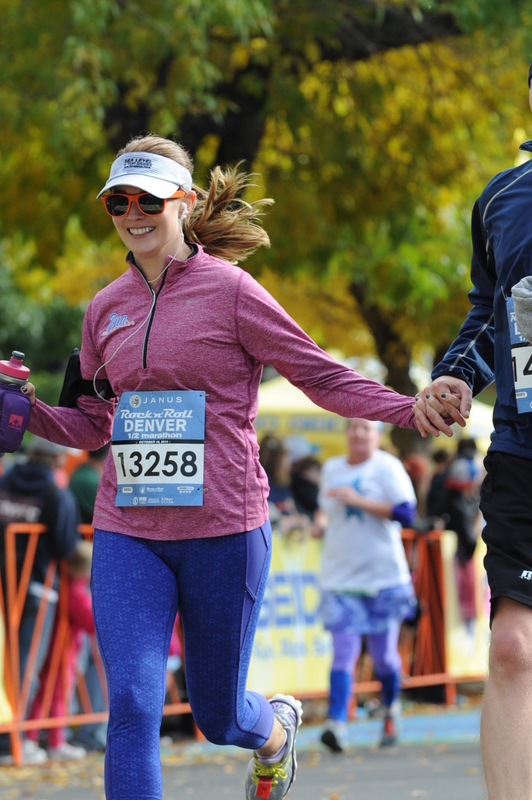 But still, there’s something about hitting those full 13.1 miles that feels different. Saturday we went to the expo downtown at the Colorado Convention Center, not knowing it was also the Denver Zombie Crawl that day. The city was nuts, and the expo closed at 5pm. We arrived at 4:25pm… Thankfully we easily got our bibs, shirts, and VIP passes (definitely worth the investment, even just for the porta potties!). We meandered a bit around the expo, but knowing everything was going to close, we wanted to beat the rush out and left at 4:45pm. Besides, we had to wake the same time the next morning, so an early dinner and bedtime were calling our names. We woke early, readied ourselves and were out the door by 5:30am. As per parking instructions for our VIP passes, we had to be in the garage by 6am before they began closing the roads around it. We made it just in time, given the traffic right around the garage. We took our time putting on our bibs and readying our outfits and paraphernalia, and made our way to Civic Center park for the VIP area. Unlike at RNR USA, participants were able to pay a $65 fee for VIP area access, rather than spend a certain amount in Brooks gear at the expo. 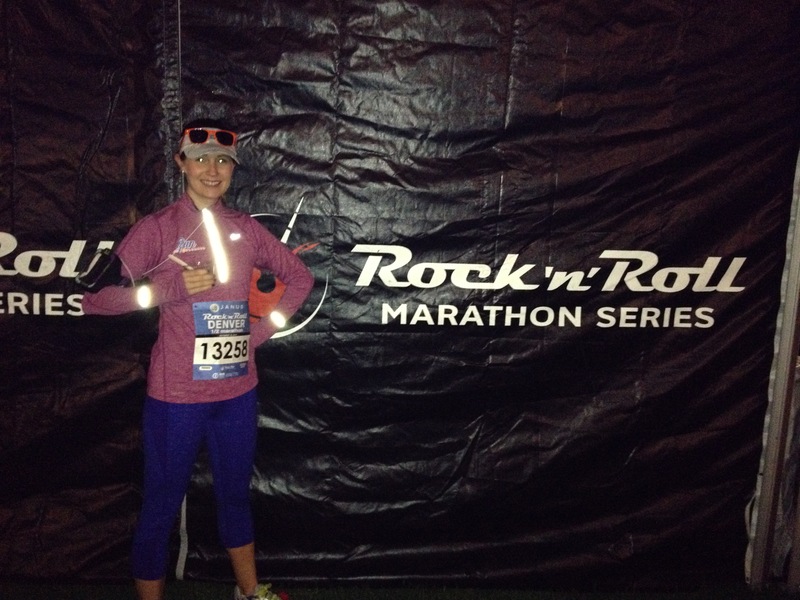 This was a huge bonus, with pre-race snacks, heat lamps and chairs and tables, and private VIP porta potties. Race day facilities leave much to be desired, so the fewer individuals utilizing these porta potties, the better. And boy, was it worth it. 45 minutes after the “start” I was raring to go! tent until 10 minutes before 7:15am, the supposed starting time of the race. We made our way through the crowded, congested throng of people, not finding our way to corral 14 until 7:20am. The race still hadn’t started at this point. Finally we heard the gun go off and the wheel chair starters were off. Then the national anthem was performed and FINALLY the first corral left. We didn’t move up for quite some time, and didn’t cross the starting line until 20 minutes later. 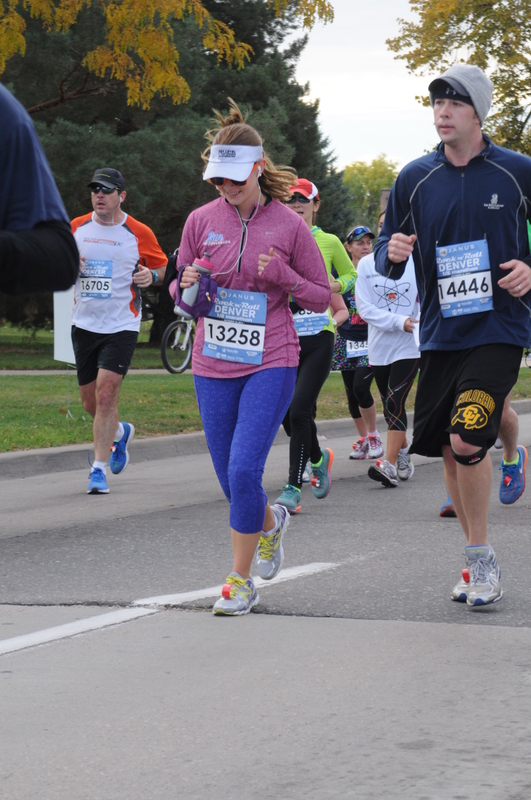 Thank you Marathon Photo for this awesome shot! 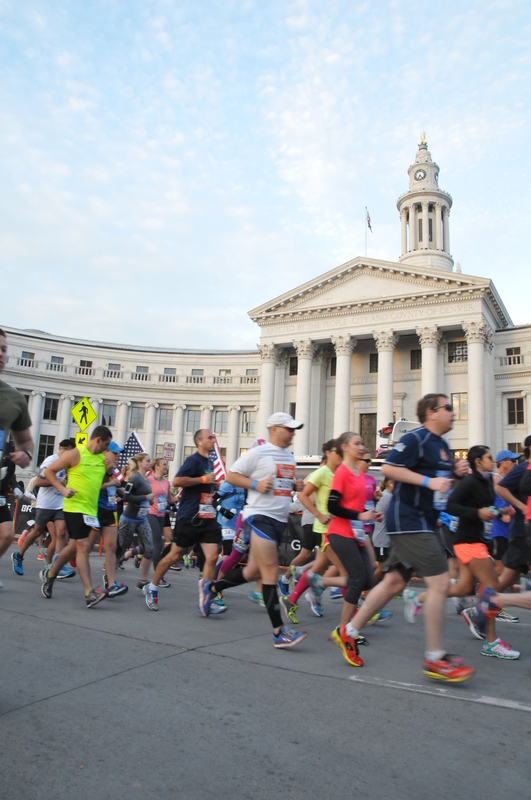 The course first took us through the city along 14th street, and then veered off towards Auraria Parkway, at which point we cut back across to the Speer bridge, crossing over I-25 into the Denver Highlands. If you’re familiar with the Highlands, you’ll know it’s got a fair amount of hills. The course took us up towards Sloan’s lake, which was absolutely stunning early in the morning with the sun rising over the Denver skyline, reflected in the calmness of the lake. I would share a picture, but as I was running for time, I didn’t stop for pictures. Apparently I passed my coworker cheering along Sheridan Boulevard, and didn’t even know it! Thankfully a beautiful course with lots of good sights and plenty of water/aid stations. Totally unaware of the photographer, go me! Finally we looped around the lake and took Tennyson Street, and down 29th, before coming by Federal Boulevard and back into the city. Between the 10K mark and mile 7, the run along 29th was amazing, as the entire street was lined with incredible signs and cheering folks emerging from their homes to rally the runners. Some of my favorite signs included one held by a 7 or 8 year old boy, which read, “Run faster! I just farted!” and another later in the race another sign read, “You paid for this?” My absolute favorite was a sign that read my mind: “Keep running, people are watching!” I am definitely a bit of a self-conscious runner, so I want to be seen actually running when there are spectators. Silly, but effective! 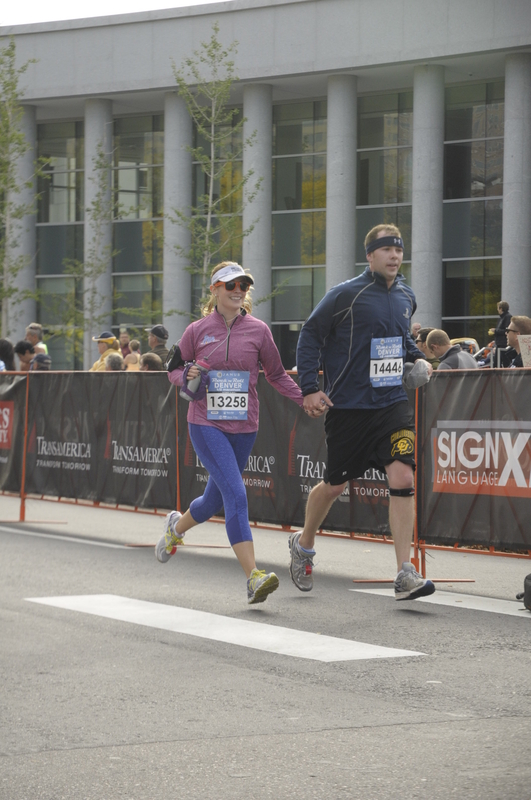 Sprinting together towards the finish line! I love it! band here was performing “Billy Jean” by Michael Jackson, so obviously I broke into a dance as we crested the hill. It was awesome. We wrapped around the stadium and took Walnut north and then ran back down Larimer, before cutting across 20th to Lincoln. Here the marathoners veered off for the second half of their race which took them through City Park and Wash Park, some of my favorite areas to run in Denver. We, however, were well on our way to the finish line, which was good because I couldn’t imagine doing another one of these! 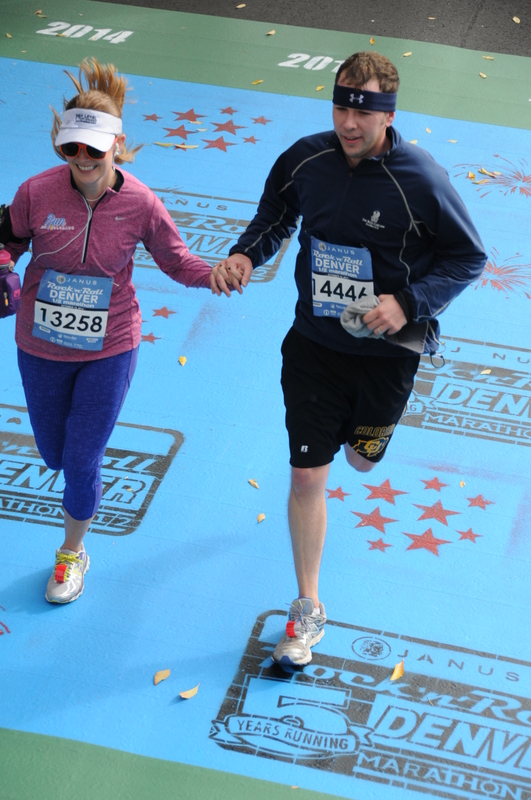 With about three tenths of a mile to go, passing right by the capitol building, the hubs and I grabbed hands and sprinted with all our might to the finish line. It was an epic rush of adrenaline and speed, topped with a heaping pile of victory. We were so thrilled to have finished strong and together. 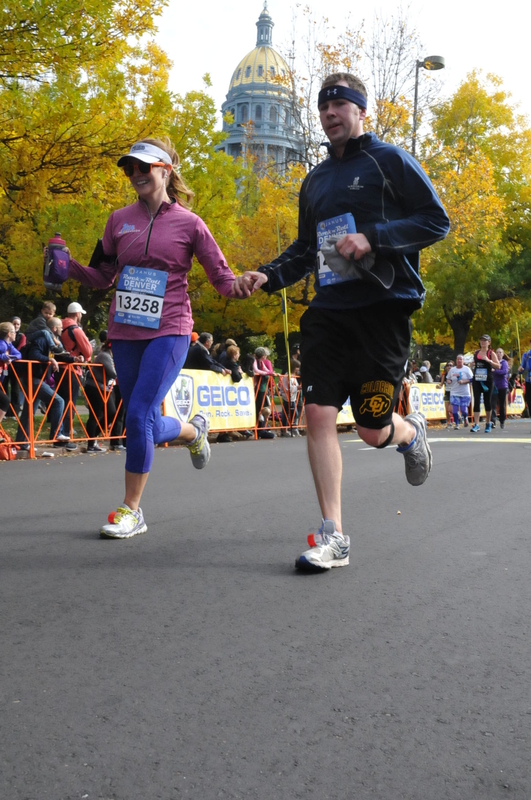 We weren’t as fast as we wanted, but better than projected: 2:20:28. That’s a time I can definitely live with! Now that’s a money shot – capitol in the background! We flit, we float, we fleetly flee, we fly! 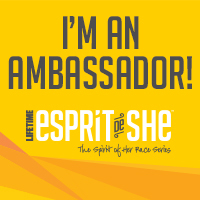 After the race we collected our awesome medals (complete with bottle opener on the back – awesome! 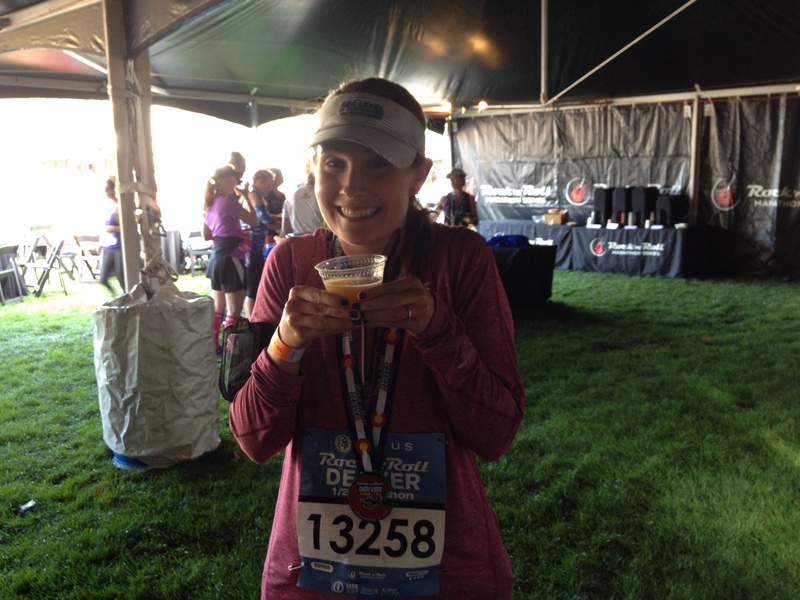 ), chocolate milk (my post-race tradition), Gatorade, water and Lara bars and found our way through the crowd back towards the VIP tent. Although we weren’t terribly hungry, I wanted my mimosa like whoa. I may have had that mimosa on my mind since we arrived in the tent. I munched on a yummy biscuit, drank my mimosa, and recharged my phone at their charging station. Yet another genius element of the VIP tent. The hubs and I then took our leave of the chaos of downtown and made it back to the garage. It took about 30 minutes to exit the garage, which is irritating when all you want to do is go home, shower, and relax, but we made the most of it. 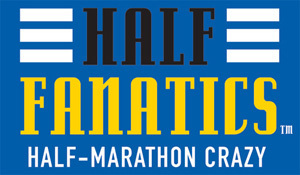 All in all, it was a fun race and a victorious start to our shared half marathon career. 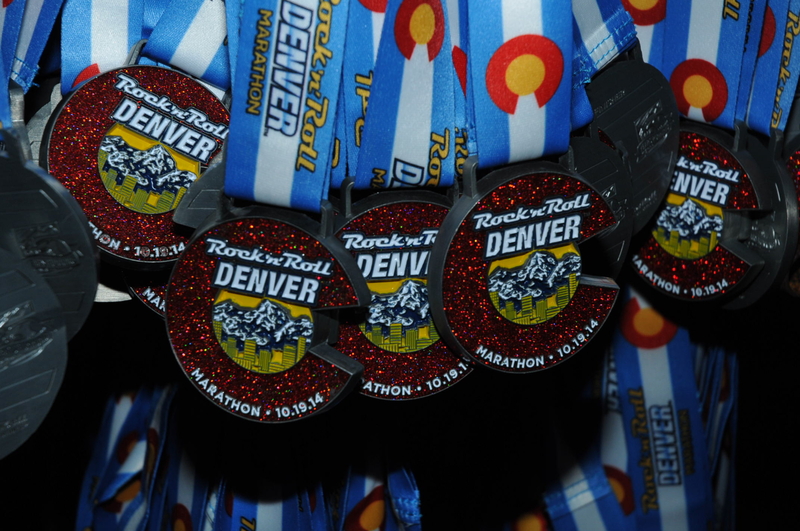 Have you ever run a Rock ‘N’ Roll race – what did you think? 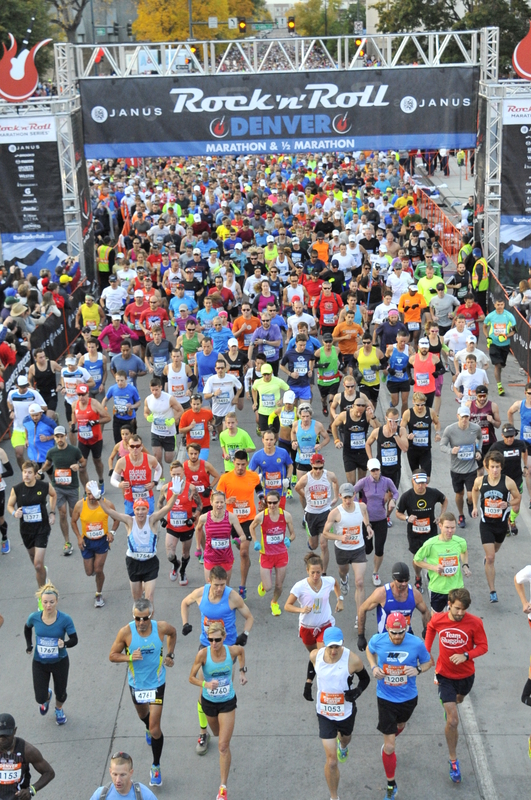 Do you prefer to run through cities or run races in remote areas? How cool is a medal that doubles as a bottle opener?